This week’s UCB or last weeks actually considering I did not get a chance to write it till now, makes a winner of Nick the Kook. He asked that I write a tale about him. Now there are literally hundreds of stupid Nick the Kook stories in the Lisanti memory bank. Besides the fact that you can almost count on Nick doing something completely stupid eight out of ten times, but the guy spent probably more time with me then I spent with my ex-wife circa 2003-2007. The kid hung around the surf shop all day long 7 days a week when I worked there, usually surfed with me after, then went skating with me that night. We even started traveling together. Kook and I have racked up a ridiculous amount of friend hours and I would have to say a retarded story would take place involving one or both of us 95% of the time. When asked to pick a story its not very easy. I mean I could write an entire segment, maybe start a new blog even about the adventures of Chris Lisanti and Nick the Kook. There are that many and since we still get together from time to time there are more to come. 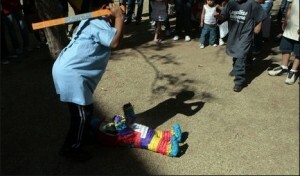 For this blog I thought I would tell the tale of a Cinco de Mayo party, a bottle of Agave and an incident of ill treatment to a piñata. Yeah you’re going to want to keep on reading for this one. I know I did not want to tell negative stories here anymore, but if a story of my own stupidity and immaturity deters at least one person from drinking too much then it was worth the humiliation. For a span of three years I was on this wild house party kick. In New Jersey that is the staple for most alcoholism especially in the winter months. I guess this took place around 2007. I could be wrong on the exact date so if anyone out there remembers feel free to correct me in the comments. My good friend Nick Kiefer one of the most talented graphic artists/photographers I know, now turned hipster musician was throwing a Cinco De Mayo party at his parents house. Now when I roll up to a party I also come with an entourage, rapper style. This was actually the very end of my house party days thus I was rolling lighter then usual with just Nick the Kook, Sindia and myself. I also brought along in proper fashion for the occasion a bottle of Mexican Agave (which is like 80 proof) a gift provided by my parents from a recent trip to Mexico. Upon entry I open the Agave and it is shots all around till the bottle was cooked. Let me mention that Kiefer’s parents were in attendance at this party and had some friends of their own at there as well. Now Agave for those of you who don’t know is the sugar component put into tequila. I think by now most of you know what happens to me when tequila is involved, I get crazy. Well Agave has an even higher sugar content meaning an even nuttier Lisanti. After four shots I was feeling pretty good, and ready to take the party up to high gear. At this point it may have been about ten at night. Kook and I decided to get people dancing in the living room. I think Kiefer’s sister and maybe two of her friends and Sindia briefly humored us. Shortly after it went from a dance circle to a drunken Nick the Kook vs Lisanti dance off, which basically ended in Kiefer’s parents big screen television nearly falling over crushing the both of us and ruining the set. Luckily Sindia stepped in being the responsible one and put a stop to our stupidity. Literally we looked like complete buffoons failing around at a lame attempt of a break dance off. From there I am pretty sure I ran around the house making imbecilic, incoherent conversation with random people while chugging way too many beers. Sindia was embarrassed, Kiefer was sorry he invited me and I am pretty sure his parents contemplated calling the police on more then one instance that night. The Kook tried to get with Kiefer’s now ex-girl friend (not from that event) and as a result was never allowed over Kiefer’s house again. I’m not certain but I think he also tried to get with Nick’s younger sister and mom as well. We were a pair of real classy guys him and I. Finally the night ended with the unveiling of this sombrero piñata. Nothing makes a drunken Cinco de Mayo party better then smashing a piñata except I think the only people drunk there were the Kook and I. A few people got their hits in on it and then it was my turn. Now why anyone at my level of intoxication would have been handed a wiffle ball bat and blind folded is beyond me, but that is exactly what happened. I came out swinging like a mad man but was way to inebriated to even come close to hitting the thing. I am pretty sure I fell over in the process also. Angry and a bit humiliated I ripped the piñata off the ceiling and smashed it against the wall. Candy fell out all over the place and then I slipped and fell on top of it all, smashing most of it under my body. Ten minutes later I found myself throwing up all over Kiefer’s bathroom, followed by the front lawn and the entire car ride home, while Sindia drove. We left Kook behind who as I stated earlier perpetuated the losing task of attempting to get with any lady left at the party. I got home, fell out of the passenger seat of the car and passed out in the marshland besides my house. Sindia left me there, pay back for the embarrassing evening and leaving her in the backyard a year ago when she got embarrassingly drunk. The funny thing is I used to be proud of this story. I thought it was a really winner to earn me browning points with others. I always thought when I told it people were laughing with me, well I finally know now they were merely just laughing at me like I was some type of circus clown. Part of me still thinks partying hard is a ton of fun, until I sit down and read what I write. Then I realize all I am doing is making a fool of myself. “He who walks in the darkness does not know where he goes” John 12:35. Remember when I broke Nick the Kook’s teeth? I thought about telling that story too. Like I said there have been a lot of them. I remember this from the Myspace days. It was painted in a much different light. I should pull this one from the archives. Good times.. at least someone has them documented..
Yeah dude those were the days. We def had some outrageous times.